Josie's Juice: Gelatissimo 'birthday cake creation' flavour and my tour of Gelatissimo HQ - delizioso! Gelatissimo 'birthday cake creation' flavour and my tour of Gelatissimo HQ - delizioso! What would you say if you were offered a tour of an Italian-style gelato-making factory? And so, off I trekked to Gelatissimo's HQ with a belly and a palate ready to trial their new ice cream flavour, one especially created to celebrate their 10th birthday. 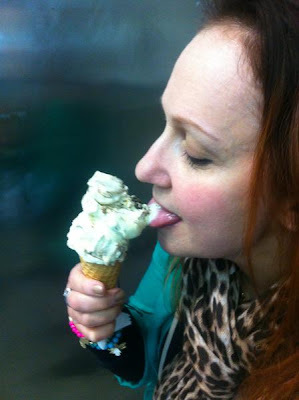 Here's me taking a polite-for-the-camera lick... in reality, I was devouring this flavour like nobody's business. It was... just... too good! This 'birthday cake creation' flavour will be available from September 6, which is ten years after they opened their very first store in Sydney. Let's talk about the flavours of this exceptional gelato: layers of chocolate sponge, soaked in coffee, mascarpone and zabaione gelato, melted Nutella and finished off with a macadamia and amaretto crumble. Yup. It's as amazing as you just imagined. The 'birthday cake creation' flavour will be available in all Gelatissimo stores from September 6 until November 11, 2012. More about the company: Gelatissimo opened their first store in 2002, with Gelatissimo now boasting over 40 locations internationally [there's even one in Florence - THE place for artisan gelato! That really impresses me]. Gelatissimo are pretty deft at creating flavours that capture their rich Italian heritage, as well as ones that embody the Australian spirit, paying homage to the country where it all began. Talk about tasty assimilation! For the remainder of the anniversary year, they will be the releasing some of the best Italian-style summer sorbets, followed by flavours that represent key cities of Italy, finally wrapping up the year-long celebration with traditional sweets from the country known for having a passion for great food – some would say [okay, I would say] they make THE best of the best. In charge of creating these new, indulgent desserts will be Gelatissimo’s newly appointed gelato making specialist, Anna Temellini. A native Italian, Anna, along with her partner and four-year-old daughter, have relocated to Australia so Anna can oversee product development. 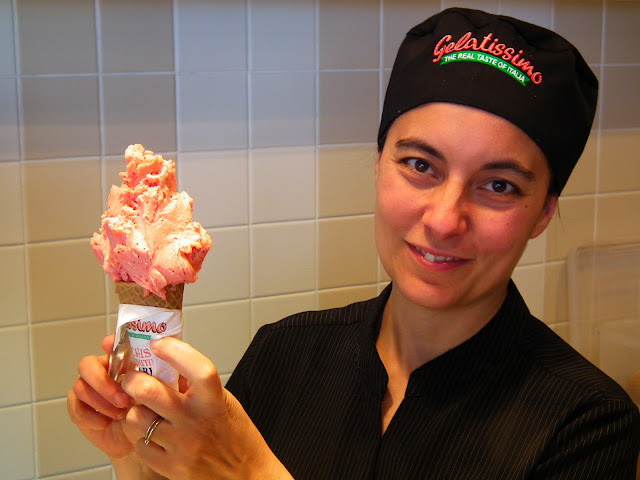 As you can imagine, the traditional gelato-making artiste is extremely excited to kick off her new position by creating an array of luscious desserts for Gelatissimo’s 10th birthday. I met Anna during my trip to Gelatissimo HQ and she is exceptional at what she does. I loved having a bilingual chat with her... and heaping warranted praise on her yummy creation, in between wolfing down the delectable gelato. for our customers, so prepared to be amazed with what we have in store for our tenth birthday year!" Gelatissimo Gelaterias are open seven days a week. Prices start from $4.90 for a 'piccolo' (one scoop). Love, love the sound of this... will pop in the store and trial. God you have a good job, Josie...! !